When two stones are thrown into a pool of water, the concentric circles of each stone’s ripple will intersect and exchange energies. I witness this type of energy transfer among people who inspire one another to make empowering decisions, and these are what I refer to as “The Reverberation of Empowerment.” Usually I am privy to these exchanges among the Sisterhood of Support and Spouse Breakfast groups. However, the other day, I received a call from a complete stranger who was inspired after reading about Chelsea and Linda Marks’ Belt Buddy project in Newsday. 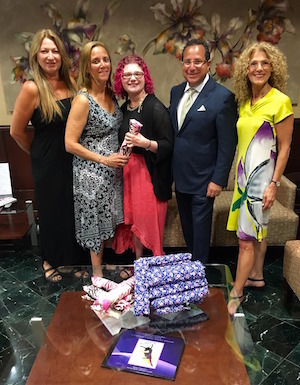 Recently, Newsday covered the story about Chelsea Marks, the incredible daughter of one of our breast reconstruction patients who initiated the Belt Buddy project for our patients. She has been greatly influenced by the model her mother has set for opening her heart to others. Chelsea, also an extraordinary thriver of a rare form of muscular dystrophy, is a model of inspiration with her tenacity and zest for life. Like our breast reconstruction patients, she well knows the challenges of living with the effects of disease and medical intervention. The reverberation from the Newsday article was experienced by a call from someone who had read the piece and was moved by it. A 5-year breast cancer thriver herself, Connie of Garden City Park, contacted me to offer fabric for the Belt Buddies and also for our femPower belts given to our patients to hold their drains following surgery. I had the pleasure of meeting this exceptional and generous woman who, for over 20 years, has been sewing and knitting clothing for children in rural Appalachia (see Operation Christmas Child) and is involved in other acts of kindness. Kindness begets kindness. No doubt about it. Connie, like Chelsea and Linda and all the thrivers, boosts our faith in humanity and offers brightness and hope in our present day world!